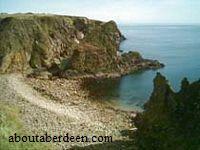 Between Cruden Bay and Boddam there is a super walk that can be easily accessed at several points or walked in one journey from either end. The full walk is about 7 miles and takes about 3 - 4 hours. Some parts are steep and the undergrowth can be challenging - but you will be rewarded with some stunning views of the Buchan coast, cliffs, sea, birds and wildlife. 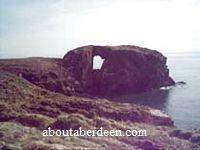 It will take you past key landmarks such as the Bullers of Buchan and Slains Castle. The full walk can be started in the car park of Cruden Bay beside the church and next to the recycle point and public toilets. The walk is signposted throughout and you are following the signs for the Nave Nortrail. Follow the wood through and up the hill. The ground can be a bit wet and boggy so do wear a good pair of walking boots and perhaps take a walking stick. This is especially good for later parts in the walk when walking through the undulating heather. 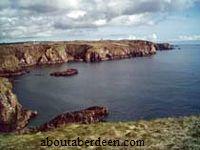 After a few minutes you will see Slains Castle up the hilltop. Do look behind you for some great views across the Cruden Bay village. It is worth taking ten minutes or more off your route to look round Slains Castle. Read more about the Castle, its history and ghosts. Continue up the path beside the farm fields and this will take you to the A975 car park. At the end of the car park is a farm track, follow this down the hill towards the sea to get to the walk route. There is a great photo opportunity here of some impressive cliffs and views out to sea. 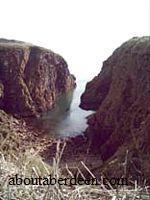 These cliffs are known locally as the Twa Havers. Next to these you should be able to make out some sea caves. Looking behind gives a view of Slains Castle with cliffs, the sea and fields in the background. The path now narrows and stays narrow for most of the walk - do please put your dog on a leash and closely supervise the children - though we do not consider it safe to take children on this walk - as there are sheer drops and it can be slippy underfoot. 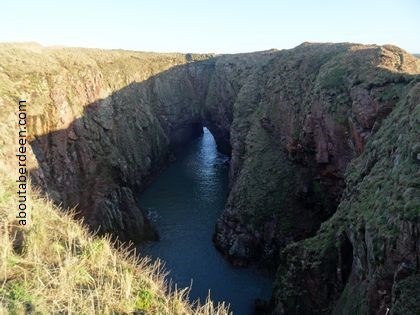 Go across the wooden bridge and you near the Bullers of Buchan. You can read about them here. The path takes you past the fishermen cottages and another joining point of the walk of another car park on the A975. There are plenty of wild flowers in this area and you'll start to smell the floral heather and the bouquet of the gorse which has a sweet hint of vanilla. There are more sea caves to be seen and these will distract you from the uphill climb. To the left is Longhaven Quarry. You will come to the Scottish Wildlife Trust (SWT) Longhaven Cliffs Wildlife Reserve where you can see many birds such as razorbills, shags, fulmars, herring gulls, kittiwakes, guillemots and glimpses of porpoises and seals bobbing about in the sea. There is a memorial tablet made from local granite in memory of James Paterson and Alexander Hamilton who died whilst climbing the cliff on the 15 October 1967. Look below to the rock face to see the remains of a Quarryman's Bothy from when this area was a Quarry. You will notice during the rest of your walk the pretty red and pink granite rocks scattered in the hills and set in the cliffs. Follow the path up the hill which now runs parallel with Long Haven Mains. To the right as you climb the wooden steps is another cave which is called the Cave O' Meackie. There is a grassed platformed viewing area here. The walk becomes more strenuous now as the undergrowth thickens. The path hugs the coastline so do take care. But do take time to stand still and admire the Buchan Coast. To the left are farm fields with grazing sheep. There are not much landmarks now, other than to follow the view of the Boddam Buchanness Lighthouse and the Peterhead Power Station. Pass a house with a fenced garden. The next farm building and farmhouse has a large grassed area which usually has several horses and a lovely friendly donkey who will follow you and keep you company down the path. The ruins of Boddam Castle should now be visible and there is a car park here. You are now in Boddam village. It's worth visiting the Buchanness Lighthouse whilst here. Though you cannot enter the lighthouse it is a relaxing walk around the outer wall. The harbour is tranquil in Boddam and there are usually fishermen active in their boats and retired fishermen in their huts ready for a wee chat. Now you need to repeat the walk to get back to your car!  Though you could always call Boddam Taxis or get a bus back from outside the Post Office.